Guard against theft with our KingSafe™ Document Security Features. King Printing Solutions Can Protect Every Inch Of Your Critical Papers. In Ways You (And Thieves) May Never See. Protect all your negotiable instruments against forgeries and fraud with our KingSafe™ Document Security System. Layering at least two or more security features into your sensitive business documents, and safeguard all your important papers. Since we started our business more than 40 years ago, King Printing Solutions has always been involved in document security. Before thieves and technology became super-sophisticated, simple features like numbering and watermarks provided protection. But in today’s world, you need to be several steps ahead of potential document theft. That’s where KingSafe Security Features come in. 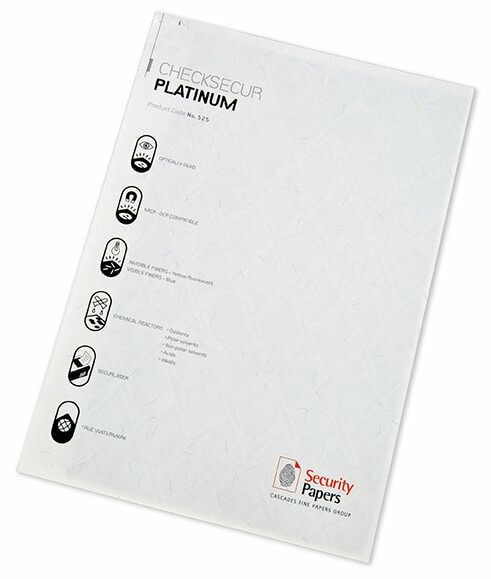 We offer more than 30 security options (plus combinations of several features) that can make it virtually impossible for your documents to be copied or reproduced. We provide security devices for checks, titles, bonds, deeds, and many other items. With KingSafe, every aspect of your document can be protected. King Printing Solutions offers a spectrum of security papers, with features including visible fibers in different colors, invisible fibers that are only seen under special light, Securlaser bonding that prevents printing from being scraped off and altered, true watermarks engineered into the paper, chemical reactions that cause colors and marks to appear if paper is chemically altered, and magnetic ink compatibility. Special security inks change color when rubbed with a metal object, penetrate the paper to imitate watermarks, glow under ultraviolet light, or change color with temperature. They can also resist photocopying or digital recreation. These screens are printed into the background of a document. They may say words like “VOID” or feature multicolors that make it almost impossible to photocopy. Microprint is very small type that is readable under magnification and becomes a solid line if copied or scanned. Microprint is commonly used for borders and signature lines. Magnetic Ink Character Recognition (MICR). This technology makes print soak through the paper and appear in a different color on the back side of the document. This is very difficult to duplicate. Security Screens. A light screen with the words “Original Document” that make duplication difficult. Padlock Icon. Used with negotiable documents, indicating that two or more security features have been used. An explanation of features appears on the back of the document in the padlock box. Warning Bands. A border that indicates the security features being used and how to detect them. It shows document handlers what should be checked to show authenticity. Anti-Splice Backer. This prevent cut-and-paste between documents. Solids or dense patterns that prevent readability of certain information. Image-friendly boxes. Allows scanning of certain areas of documents for Check 21 or other compliance. Eurion Constellation Pattern, which causes a copy of any document to print black. Bond And Carbonless Papers. These check papers allow laser printing and endorsement. Secure Distribution. Specialty papers and printed documents are kept secure during shipping and storage.